The previous evening he had been to a symphony concert at the Pleyel Hall in Paris. Inspired by the music he had canceled the rest of his stay in Paris and raced back through the night to his studio overlooking the ramparts of the old town of Antibes, desperate to capture the images while they were still fresh in his mind. He started work on the painting as soon as he got home, and without stopping for food or rest, worked feverishly at the vast canvas until further work was made impossible by the failing light. It was to be his last painting. As darkness fell he turned his back on the unfinished painting, wrote three letters, burned his sketches for all future projects, walked to the window of his studio, and jumped into the rue de Revely, four floors below. Late that evening, a neighbor walking her dog found his twisted body. He had died instantly, at the age of 41. It was March 16, 1955. The artist’s name was Nicolas de Staël. At that time he was approaching the peak of his success. He had held major exhibitions in Paris, London, and New York, and was preparing for one in Antibes later in the year. His life story reads like a Mills and Boone novel. He was born in St. Petersburg in December 1913, the son of a Russian baron on the staff of Tsar Nicholas II. In 1918, to escape the Bolshevik Revolution, the family fled to Poland, where, within a few years, both of his parents died, leaving him an orphan at the age of nine. He and his sisters were placed in the care of a Russian family in Brussels. 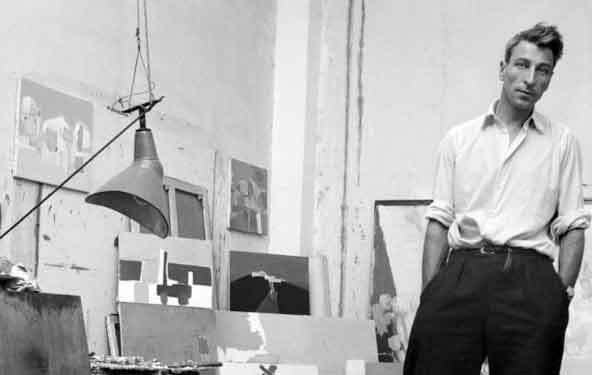 Nicolas de Staël traveled continuously for the rest of his life, studying painting in Belgium, Holland, and Paris, and visiting the great museums of Spain and Italy. In Morocco at the beginning of World War II, he joined the French Foreign Legion. He returned to France after demobilization, and by the end of the war was living in the rue Boissy d’Anglas in Nice. During the occupation life of an impoverished immigrant was hard and he supported his sick wife, Jeannine, and her son by working as a furniture polisher. In 1946, following Jeannine’s death in childbirth, he continued his travels, dabbling in sculpture and tapestry, but always returning to painting. Despite his peripatetic lifestyle, his work rate was frenzied, his output prolific, and his range eclectic. Impressed by a football match between France and Sweden at the Parc des Princes, he created a series of works called Les Footballeurs; after hearing the New Orleans clarinetist Sydney Bechet playing jazz in Antibes, he created his collection Les Musiciens de Jazz, Souvenir de Sydney Bechet. In 1953 he rented the apartment in the rue de Revely, facing the Mediterranean in old Antibes. Like so many artists before him, Nicolas de Staël was enchanted by the light and colors of the Côte d’Azur. Antibes, its harbor and beaches, its Fort Carré and its incessant marine traffic featured prominently in his later works, but he brought to them his own unique style. Although his work contains elements of a number of twentieth-century‘ isms’, it defies precise classification. It is abstract, but never loses sight of its original inspiration. (He once said, ‘a painting should be abstract as well as figurative’). Although unmistakeably modern, his work reveals echoes of Russian icons and the mosaics of medieval Italy. De Staël’s technique was energetic, with pure, powerful colors and strong, oil-heavy brush strokes (when he died he had an outstanding bill for 5,000 Euros for paint). A giant in every sense – he stood a gaunt one meter ninety (6 feet 3 inches) tall – he preferred huge canvasses. This last painting measures six meters by three meters fifty. That painting is called Le Concert, and I have a print of it on my wall. It shows, against a striking Tuscan Red background, some music stands and scattered sheets of music. But its main features are a grand piano and a double bass – the two instruments that are usually left on stage when the concert is over. It is almost as if he were leaving a final message. 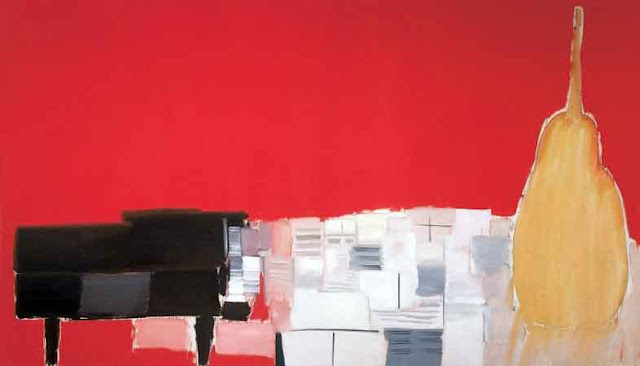 You can see Le Concert at the Chateau Grimaldi in Antibes, where, until October 16, 2005, the Picasso museum is dedicated to a retrospective view of the work of its former neighbor, Nicolas de Staël, whose brief but meteoric career ended so tragically 50 years ago, just a few meters away.